At the center of our second summer of programming around Fo Wilson’s project, Eliza’s Peculiar Cabinet of Curiosities, is a residency with filmmaker Portia Cobb. During her residency, Cobb will create a new conceptual work, Rooted: The Storied Land, Memory, and Belonging. Cobb draws on her South Carolina roots to respond to and extend the narrative first created by Fo Wilson when she imagined a 19th-century enslaved woman and what she might collect in her living quarters. While Eliza lived in the antebellum South, in Wilson’s Afrofuturist installation she is able to travel freely into the past and future, and the objects in her cabinet, or cabin, speak to this freedom. Cobb has conjured “Lizzie,” a binary character who complements and echoes Eliza. 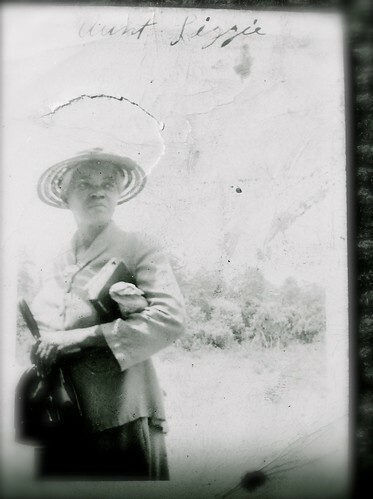 Lizzie is a Gullah-Geechee woman, descended from Africans captured along the coast of West Africa who developed a distinctive Creole and culture in the coastal plains and Sea Islands of the American South. By Cobb’s reckoning, Lizzie was born in coastal South Carolina 20 years after the American Civil War and 10 years following Reconstruction. Lizzie is a woman born free, descended from survivors of slavery, who is independent and living within a newly emancipated community. Rooted activates memory as memorial through the creation of “Lizzie’s Garden,” a sustenance heritage garden just a few feet from Eliza’s Cabinet. This garden embodies the memory of food ways that survived slavery. There is no question that Lizzie would have cultivated the fields surrounding her family’s compound to plant such a garden. She would have jarred tomato, okra, corn, peas, and lima beans from its harvest. She would have processed sugar cane to make molasses and made homemade wine from fruits and wild berries. In Cobb’s extended performance, this space and Lizzie’s spirit are animated by her descendant “Portia.” Cobb has recreated Lizzie’s garden by planting okra, cabbage, collard greens, tomato, cucumber, cowpeas, peppers, herbs, sweet potato, and peanuts (goobers), and Portia tends it during the growing season. Some items will be harvested at the end of the growing season, while other crops may mature into the early days of winter. “Lizzie” also honors the memory and oral history of the artist’s great aunt Elizabeth Ashe-Smashum (1887-1976). Like Cobb’s Aunt Lizzie, the imaginary Lizzie is literate, spiritual, and admires the writings of celebrated poet, librettist, novelist, and playwright Paul Laurence Dunbar (1872-1906), whose writing uplifted African Americans. As the only girl in a family dominated by brothers, Aunt Lizzie became the caregiver of nieces and nephews as well as a daughter she later adopts. She creates stories and involves the chiren (children) in directed performances and recitations of selected works by Dunbar. These performances entertained family and neighbors, and may have been shared with larger audiences during holiday celebrations at their A.M.E. church. Following the death of her husband, Aunt Lizzie created “Uncle Pomp,” a ghost-hobo character, by dressing in her deceased husband’s clothing and covering her head with a moss-draped hat. Uncle Pomp emerged when Aunt Lizzie needed to entertain or exact obedience from the children in her care. Cobb will re-enact one of Aunt Lizzie’s performances. Over the course of the summer, as Portia tends Lizzie’s garden, Cobb will work her way toward an understanding of the kinship between Eliza and Lizzie, who may have been sisters, cousins or an aunt and a niece. Cobb has also invited a series of guests—several from South Carolina--to respond to both Lizzie and Eliza. Chef and food anthropologist Scott Barton will pickle some of the garden’s produce and create a community table. Textile artist Arianne King Comer (August 3-13) will join the Lizzie project for a two-week residency, working with community members to make a cloth book of recipes related to Lizzie’s Garden, and sharing indigo and other dyeing techniques at events such as Lynden’s Free Family Day (August 5). Musicians will perform on the porch of Eliza’s Cabinet: Arsene DeLay on July 23; SistaStrings on August 5; and Charleston, South Carolina native and baritone Benjamin Seabrook, who will sing musical selections of 19th-century librettos written to uplift African Americans (watch for Paul Laurence Dunbar here). As we prepare for pickling, cooking, and recipe-bookmaking, Cobb has started to put together a list of Sea Island possibilities: Okra Soup and or Succotash Pan-fried Okra, Tomato, Corn and Lima Beans; Sweet Potato Pone; Indian Pudding; Boiled Peanuts; Red Rice or Hoppin’ John (Rice and Peas); Squash; Stewed Cabbage; Fried Tomatoes; Bread and Butter Pickles; Pickled or Fried Green Tomato. Do you have a recipe you’d like to share? A favorite way to prepare okra? Would you like to participate in Arianne King Comer’s workshop? If so, send your ideas, stories, questions, and requests to lizzie@lyndensculpturegarden.org. Portia Cobb is an interdisciplinary artist whose work is drawn from personal and collective history and memory; a fusion of documentary, ethnography, personal essay, and folklore. It extends from the documentary moving and static image frame to performance. Performing Grace, her non-linear video meditation on mercy, forgiving, and forced forgetting, was shot on location at Lynden and was selected for the 2016 Wisconsin Triennial at the Madison Museum of Contemporary Art.